According to expected wOBA, which is not perfect, but which is pretty good, the most improved hitter in the major leagues is Mookie Betts. The second-most improved hitter is Leonys Martin, and the third-most improved hitter is Matt Davidson. Since xwOBA is only one measure, that means we can have a conversation. And that means there’s an argument for each of those three players, along with some others. I’ll lay out the case for Davidson here. It’s every bit as simple as it is impressive. At this writing, Davidson is tied for the seventh-highest xwOBA overall. He’s right there with Kris Bryant. No one in baseball has a higher xwOBA on batted balls alone. If you prefer something a little more familiar, Davidson has bumped his wRC+ from 83 to 161, the second number being almost double the first. For anyone who knows anything about Davidson, the power has always been present. The improvement has taken place elsewhere. It’s maybe the most difficult improvement to make, but the easiest one to explain. The at-bat wound up with a home run, but as usual, it was in part a result of the sequence. Davidson only had the opportunity to go deep because he worked the count to 2-and-2 in the first place. He got there by taking a couple of very close pitches. And I’m struck by how confidently Davidson didn’t swing, at either one. I know that, at 0-and-2, he checked a swing, but he was in control of the check. Davidson had those pitches read. And he had the 2-and-2 pitch read, as something he’d like to punish. Matt Davidson made news this year for homering three times on opening day. That’s remarkable for obvious reasons, but the performance didn’t mean much on its own. Granted, all three homers were hit harder than anything Davidson hit throughout all of 2017. But, throughout all of 2017, Davidson struck out 37% of the time. He walked 4% of the time. Those are unplayable numbers, for any team that’s trying to win. Davidson needed to show he could hit with a better understanding of the strike zone. That was going to take more than one three-homer barrage. This is so hard, and so easy. It’s easy to understand what’s going on, but it’s hard for any hitter to actually pull off. What’s one of the first rules anyone ever learns about hitting? Swing at strikes, and not at balls. That’s just Baseball 101. What we know is that major-league pitchers are absurdly talented, and they’re good at getting hitters to chase. If it were that easy to lay off of balls, more hitters would take more balls. Now, from last year to this year, Davidson has kept about the same in-zone swing rate. He’s still swinging at almost two-thirds of strikes. But when it comes to chase rate, Davidson has gotten better by 12 percentage points. He’s trimmed his chase rate by more than a third, which would be one of the biggest year-to-year improvements we have on record. With any huge early improvement, you should expect to see a certain amount of regression. Hitters make changes, and then pitchers figure out new ways to successfully attack them. But Davidson looks like he’s just seeing the ball better, and I’ll tell you what I find the most encouraging. Maybe the truest test of discipline is how hitters swing with two strikes. 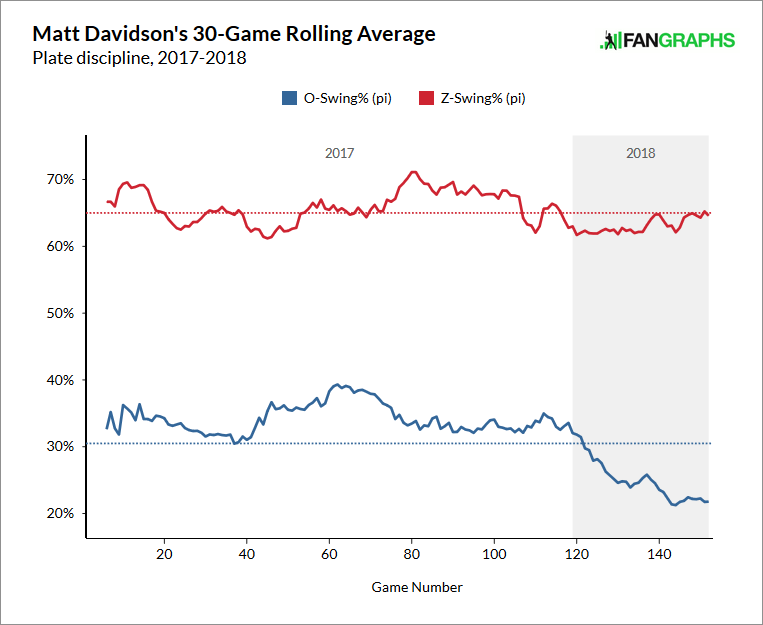 In two-strike counts, Davidson’s in-zone swing rate has gone up, by four points. And yet, also in two-strike counts, his out-of-zone swing rate has gone down, by 19 points. By 19 points! No hitter has shown that kind of improvement. There are 83 players who have seen at least 100 out-of-zone pitches this year in two-strike counts. Davidson owns the very lowest chase rate, lower even than Mike Trout himself. Even when Davidson has been pushed into swing mode, he’s maintained his new discipline, which is no small feat. It’s tempting to take defensive swings against anything close. Davidson has resisted the urge. Mechanically, he doesn’t look like a different hitter. But we know he’s made changes, because his approach is so much better, and because his average launch angle has come down by eight degrees. If Davidson is indeed thinking about a flatter bat path, he wouldn’t be alone. His swing is actually fairly compact, given how much power it can generate. You could say Davidson is just using it more judiciously. As he slumped and slumped further in 2017, he felt like he was always behind, and far too easy to pitch to. Now he’s making more pitchers come to him. That’s half of good hitting. For Davidson, the other half has never been a problem. Coming into the year, Davidson looked like the White Sox’ primary designated hitter. And, related to that, the White Sox were projected to be awful at designated hitter. Davidson was projected to be below replacement level, which didn’t feel unfair, given that 2017 Davidson finished with a WAR of -0.9. When I looked at Chicago’s DH situation, I saw an opportunity to buy a prospect. Mentally, I kept trying to figure out trades for Matt Kemp. I didn’t believe in Davidson, because I figured he’d already failed his test. Now the White Sox are being rewarded for their patience. Even though Davidson is 27 years old, he wouldn’t be the game’s first late bloomer. And while many young White Sox starting pitchers have run into trouble, Davidson is becoming a value the team didn’t expect. Rebuilds succeed in part because quality prospects become quality players. And they succeed in part because other quality players seemingly emerge out of nowhere. Matt Davidson is blossoming into a force. And so the rebuild takes another step forward. We hoped you liked reading (Maybe) The Most Improved Hitter in Baseball by Jeff Sullivan!